It's finally fall! I'm so excited that the leaves are starting to change and the weather has already cooled down a significant amount here in Seattle. I've been trading dresses and shorts for long sleeves, sweaters, and denim and I couldn't be happier. Although I do love a good sundress, there's nothing I love more than a comfy sweater. It just makes me feel relaxed and ready to snuggle up with a good book and a cup of apple cider. Even though it's barely fall, my apartment is already well decorated for Halloween (Homegoods is where it's at everybody! I've already bought three decorations and a real pumpkin...) and I'll slowly be adding more until the holiday is here. Side note, I have NO IDEA what I want to be this year. Last year I was Winnie the Pooh, but can't think of anything for this year and am open to suggestion. Now, going back to my favorite article of clothing for fall...sweaters! 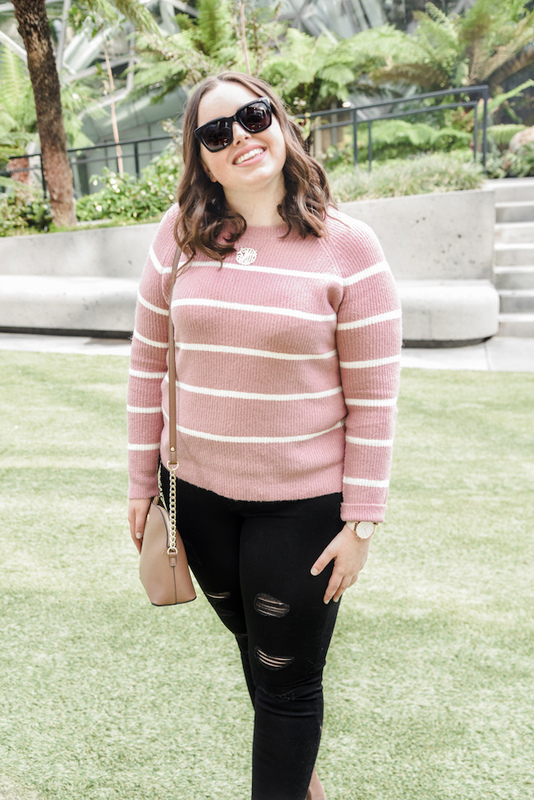 I purchased this pink striped sweater at Marshalls the other day and thought it was the perfect way to add a pop of color to a traditional fall outfit. Don't get me wrong, I love a good all neutral outfit and think they work great during the fall, but I can never resist a colorful sweater! 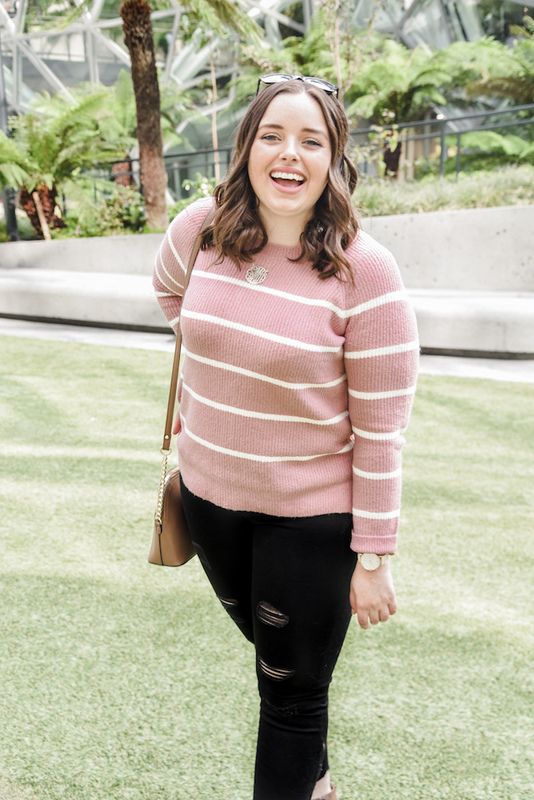 I think keeping some brighter colors in your wardrobe makes it much easier to transition into fall, so adding a few staple sweaters like this one will make it easier to do just that. Plus, I can't resist adding more pink to my wardrobe! It's my favorite color, yet somehow I'm lacking it in my closet, so I'm on a mission to add more pink, haha. I don't have the exact sweater available for you, but I've linked a few similar options for you all to look through. I'm also wearing a new favorite piece of jewelry in this post, a pretty delicate opal ring! I bought it while in Atlanta and haven't taken it off since. It's so 'me' and luckily it's available online so I can share with you. The designer is La Kaiser and I think I'm just going to have to purchase everything on her site (I promise this isn't sponsored, her pieces are just too pretty!). And since we're on the topic of accessories, I'm also wearing some awesome ones from MVMT. I'm always trying to find new sunglasses since I'm constantly feeling like I'm wearing the same pair. As a fashion blogger I feel like I have to constantly change them up, and thankfully I found a style that works for me. 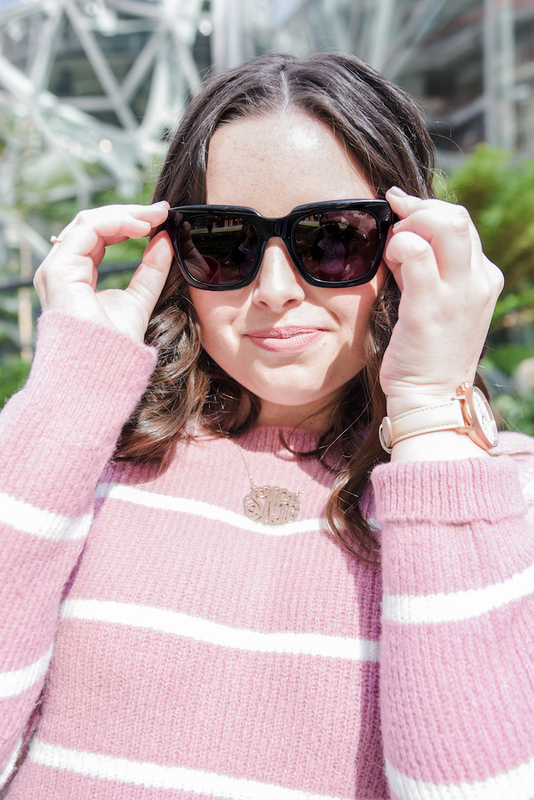 Since I have a round face I can't go anywhere near round sunglasses, but these ones are square enough that they compliment my face instead of making it look larger. I've also been searching for a nice watch to wear every day that isn't bulky and will match most of my outfits. 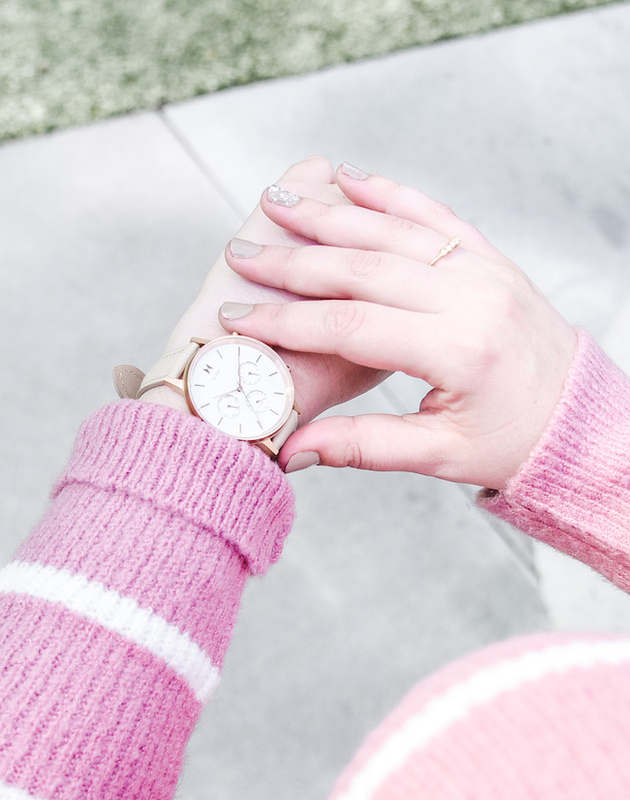 I love the blush band of this watch and like that it looks much fancier than it actually is, haha! I don't know if other people do this, but I have a small list of things that if I do them I get to call myself an actual adult. One of these things was getting a watch I like, the other two are moisturizing everyday and keeping my hands and feet lotioned. Weird things like that make me feel like I have my life together, anyone else feel the same way? On another note, I'll be keeping pretty busy these next few weeks, mostly with traveling. As much as I love traveling, it does get a little tiresome spending most of my time away from home! I was just in Atlanta, next week I'm going on a weekend getaway to Canada for my best friend's birthday, the week after that I'll be in Texas, and then traveling to both Northern and Southern California two weeks after that! So. Much. Travel. Although I think I'm most excited for Texas since I've never been there before. And don't worry, I'll be sharing a bit on each place when all the traveling is done! So, what's on your plate for the first few weeks of fall? What a lovely color of the sweater! I love the stripes too. Can never go wrong with that. I always love pink in the autumn...and I seem to be a thing with stripes. My closet is full of them! This is such a cute sweater!! I love stripes and this color, so I definitely need to grab this for Fall! That sweater is so cute! I love the color and the stripes are a classic! I love the fun Marshall's finds! This look is so cute on you! This striped sweater is just so cute on you! I love how you paired it with the black denim! Totally agree, adds such a good pop for fall! Love a good go-to sweater. So cute babe! So glad that it's finally sweater season, I love this time of year! I need those black ripped jeans! Such a perfect Fall staple!